There are just 10 days to go before the simmer transfer window slams shut a week on Monday, and we could still see players coming into Newcastle and also players leaving the club. Alan also mentioned that Cheick had not asked for a transfer, but players very rarely ask for a transfer these days, so they get money when they are moved, so it’s often only a last resort to request a transfer when a player really wants to move, and he’s giving up some money to do that. That’s not the case with Cheick it seems, but there will likely be at least one more bid coming in for Tiote, and we just hope that Newcastle can execute their plan if Cheick does move late in the window. That didn’t happen when we sold Andy Carroll or Yohan Cabaye in January transfer windows, and Newcastle suffered for it in the second half of the season in both cases. Alan now knows that if a good bid comes in for Cheick he will be sold, however much Alan protests about it to Mike Ashley and Lee Charnley. Previous Post Santon Out Three Months - What's Happened To This Other Player? Why oh why are they sitting with a plan in place, should Tiote leave? If that’s likely to happen, then surely it makes sense to replace him before he nears the departure lounge, rather than ‘try’ and fail because fees have been inflated by virtue of the window nearing closure. When Ashley gets a sniff of money, he’s like a rabbit in headlights! I agree with you about Tiote, his passing has been poor, loosing possession by trying to be clever dribbling in circles in our own half, and rash challengers etc, gaining him cards. But then all of this took place in an unsettled, under performing team where options were limited. When the team is doing well, and players are making themselves available around him Tiote is one of the best Defensive Midfielders in the business. I shudder to think how many more goals our defense would have conceded had Tiote not been on the field to make those last ditch tackles that broke up attacking play, or got himself booked for taking out a player in a dangerous position. For me we should keep Tiote because with the team we have now I think he will be outstanding in the middle once again. When you say ‘the guy is only a puppet’, presumably you are referring to Pardew rather than to Tiote and if so, then you are absolutely right. 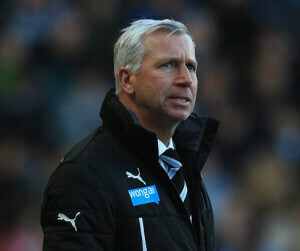 Pardew, like every other member of the NUFC staff, are puppets, subject to the whims of the grand puppet master MA. They are obliged to dance to his tune and accept whatever comes their way in the way of players sold without replacements, complimentary tickets suddenly denied and no doubt any number of minor disrespects which we are unaware of. This guy can, and does, do whatever he feels like doing at St.James’ park and it must be pretty near impossible for anyone working under him to do the sort of decent job he would want to. The problems at NUFC start and end with Mike Ashley, NOT with his manager or staff. I disagree…….Pardew is the problem, not just part of the problem. It’s all very well you repeating your old refrain “Pardew out”, but who do you think would be prepared to take on the job in his place, knowing the conditions under which he would have to work at NUFC.? might jump at the opportunity, and MA would be happy to take him on at a smaller salary, but with no Premier league experience and not a lot on his CV, it wouldn’t be long before posters like you would be throwing this back at him and calling for him to go. I repeat, the problem is at the top, and our club will remain dysfunctional until the time that Ashley gets tired of his puppet game and moves on to monopoly. I don’t get the fuss about Tiote leaving. A great player yes but we have plenty of options all looking to fill the two positions available. Let’s just say Tiote was sold and NUFC go and buy a top defensive mid. That means for these two positions you would be playing this one purchased player and then 1 out of Colback, Sissoko, Anita, Abied or Bigi. We have plenty of options in there. To a lesser extent the same goes for the strikers where we have a lot of them but maybe not the one big name signing people crave. BUT if we did buy a 20+ goals striker what would all the others be doing and why were they purchased? I can’t help feeling that one player may go and then that will be us done in the transfer market. Makes no difference whatsoever, we can speculate, complain and argue but it isn’t going to change the mind of anyone who can make things happen. So we put our points across, and some people agree and some people disagree. I’m sure that we could name a dozen or more players for each position who would improve us as a team. But we can’t effect change. Would be nice to think that someone involved with decision making would browse forums such as this occasionally , but somehow I don’t think they do or ever will.